The Vilnius Regional Administrative Court has rejected a complaint of the parents of children attending J. Lelewel High School in Vilnius. The parents do not agree for the school to be moved from its current location of Antakalnis into a building in Žirmūnai where A. Wiwulski primary school is located. The court recognized the complaint as invalid. Therefore, the decision will be appealed to higher court. J. Lelewel High School (former High School Nr 5) is the first post-war Polish school in Vilnius. The history of the school is much longer. In 1915, during German occupation, Joachim Lelewel Junior High was found as one of the first Polish schools in Vilnius. Lelewel School, and High School Nr 5 after the war was changing locations and status several times. At present, it seeks status of „long junior high”, which means that the school will execute the curriculum of engineering school. 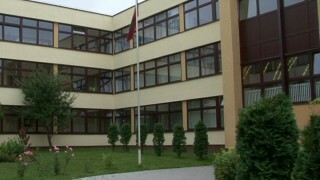 The Lithuanian school situated in the same district (Antakalnis), which applied for the status of junior high at the same time as former Lelewel School did, works as engineering high school since September 2015. Meanwhile, the future of the Polish school is still uncertain. During the summer holiday, a week before the sitting of the local self-government’s Council (i.e. 15 July 2015), a conservative vicemayor Valdas Benkunskas visited Lelewel High School with a proposition which was actually an ultimatum. „We have ten high schools that will be transformed into primary schools. We make an exception for J. Lelewel High School. As it currently operates in two buildings, and those buildings are only full in 50%, we suggest moving the school to the building on Minties street. The school will be given two years of interim period to meet the requirements of a junior high”, stated Valdas Benkunskas, who as a vicemayor is directly responsible for educational issues in the city. On 15 July 2015, the local Council has made a decision that J. Lelewel High School can apply for a status of junior high, but starting September 2016 the school shall be moved from Antakalnis to Žirmūnai. The decision was reached thanks to votes of liberal-conservative coalition that currently rules in the city. The school community does not agree for such extortion, thus the case was submitted to be resolved by the court. In the aplication submitted to the court the community wrote that „moving [the school] to the building located on the other side of the river prevents the school authorities from providing the pupils with the proper learning conditions”. Moreover, the only school teaching in minority languages in Antakalnis will be liquidated. Unfortunately, the Vilnius Regional Administrative Court did not recognise the parents’ arguments. The complaint was rejected as invalid. The parents are going to appeal this decision in the higher court. Tłumaczenie by Klaudia Chmura	w ramach praktyk w Europejskiej Fundacji Praw Człowieka, www.efhr.eu. Translated by Klaudia Chmura	within the framework of a traineeship programme of the European Foundation of Human Rights, www.efhr.eu.